THE SKINNY: There are some things you just can't beat for $1. e.l.f. Duo Cream Eyeshadow is one of those things. If this cream shadow would have cost more than $1, I would have been a little disappointed. But it's totally worth the price. My shadow arrived looking as if it had melted and re-dried. (I have no idea if this is the product or the summer shipping.) The shadow needed to be scraped up and blended between my fingertips before I could put it on. But it went on smoothly and blended easily. 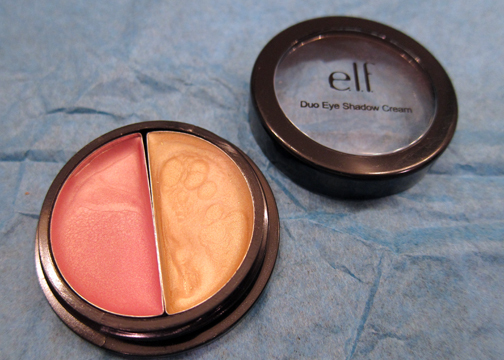 This color combination, a pale pink and pale gold, was a little too light for my fair skin. But it's kind of perfect for a weekend when you want a little coverage but don't want to look made up. The shadow lasted few hours before it wore off. KEEP OR TOSS: Keep. I'll probably buy more, too. CHECK IT OUT: This cream shadow comes in nine color combinations, including a blue-gray combination (blueberry) that looks fun.